this product would be the perfect solution to take care of my hands. Earth Therapeutics Soft Hands Gel gloves were basically ultra moisturizing gel lined gloves which when worn continuously delivered a skin nourishing infusion of jojoba and olive oil to replenish and revive hands with its deep treatment. Initially I was a rather a little doubtful of its successful results but since these Soft Hands Gel gloves did not show any signs of any kind of disadvantage in using them, I decided to give them a try. Since it was just impossible to use these gel gloves during the day, I decide to give my hands an intensive conditioning by wearing them just before retiring to bed. After applying a hand cream and putting on Earth Therapeutics Soft Hands Gel gloves for about two – three days a week- my hands started showing remarked signs of improvement. Not only did my hands feel soft and silky but they felt suppler and above all looked young and beautiful too. Wow- that was just fantastic! I just couldn’t believe that these Soft Hands Gel gloves could work so well. They were indeed magical. Hands Gel gloves could be machine washed hence making it easy for me to maintain them without any kind of hassle. 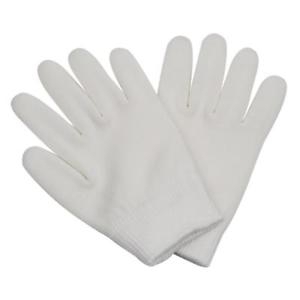 Since these hand gloves were reusable and also the fact that one size fitted all - made it easier for me and my sister to use the same pair of hand gloves every alternate days thus proving to be highly economical. Caution: Do not wear Earth Therapeutics Soft Hands Gel gloves on open wounds or if you have a skin condition such as psoriasis or Eczema.